BERLIN (AP) ― The cost of keeping global warming in check is “relatively modest,” but only if the world acts quickly to reverse the buildup of heat-trapping gases in the atmosphere, the head of the U.N.’s expert panel on climate change said Sunday. Such gases, mainly carbon from the burning of fossil fuels, rose on average by 2.2 percent a year in 2000-2010, driven by the use of coal in the power sector, officials said as they launched the Intergovernmental Panel of Climate Change’s report on measures to fight global warming. Without additional measures to contain emissions, global temperatures will rise about 3 degrees to 4 degrees Celsius by 2100 compared to current levels, the panel said. “The longer we delay the higher would be the cost,” IPCC chairman Rajendra Pachauri told the Associated Press after the panel’s weeklong session in Berlin. 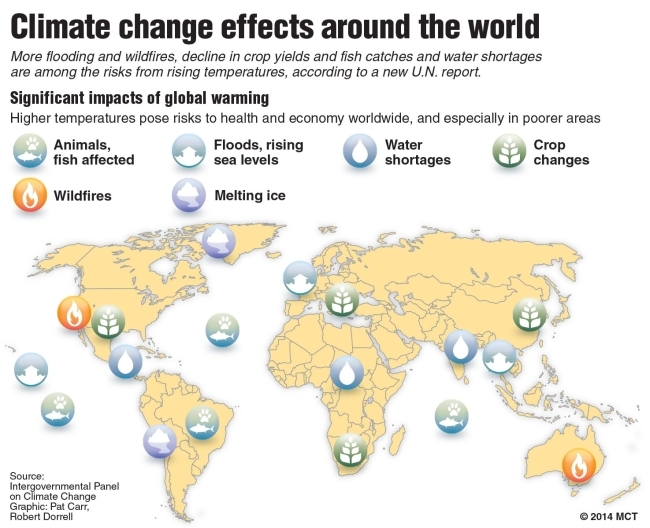 The IPCC, an international body assessing climate science, projected that shifting the energy system from fossil fuels to zero- or low-carbon sources including wind and solar power would reduce consumption growth by about 0.06 percentage points per year, adding that that didn’t take into account the economic benefits of reduced climate change. “The loss in consumption is relatively modest,” Pachauri said. The IPCC said the shift would entail a near-quadrupling of low-carbon energy ― which in the panel’s projections included renewable sources as well as nuclear power and fossil fuel-fired plants equipped with technologies to capture some of the emissions. U.S. Secretary of State John Kerry called it a global economic opportunity. “So many of the technologies that will help us fight climate change are far cheaper, more readily available, and better performing than they were when the last IPCC assessment was released less than a decade ago,” Kerry said. The IPCC said large changes in investments would be required. Fossil fuel investments in the power sector would drop by about $30 billion annually while investments in low-carbon sources would grow by $147 billion. Meanwhile, annual investments in energy efficiency in transport, buildings and industry sectors would grow by $336 billion. The message contrasted with oil and gas company Exxon Mobil’s projection two weeks ago that the world’s climate policies are “highly unlikely” to stop it from selling fossil fuels far into the future, saying they are critical to global development and economic growth. Coal emissions have declined in the U.S. as some power plants have switched to lower-priced natural gas but they are fueling economic growth in China and India.